Ink cartridge cannot be recognised is a fairly common error experienced by many Epson printer users. And receiving one of these messages can be most frustrating, because 'cartridge(s) not recognised' error usually translates into 'printer not working'. In other words...you're not printing anything until the error is cleared. If your printer is currently non operational - with 'Ink cartridges cannot be recognised' error (similar to above), don't panic. The solution can often be as simple as switching the printer off and on again. If that doesn't work and the problem persists...read on. What causes 'Ink cartridge cannot be recognised' errors? There is no simple answer to this...there can be many causes. It can mean just about anything from cartridge declared empty by the printer to outdated or faulty chip, missing or incorrectly installed (not clicked in properly) cartridge, ink on the chip or printer contacts. It can also indicate some hardware fault with the printer itself. Note: It's perfectly normal to see 'Ink cartridges not recognised' error with almost empty/empty Epson ink cartridges. What does 'Ink cartridges cannot be recognised' mean? 9/10 times, the 'Ink cartridges cannot be recognised' or similar message, doesn't mean there is anything wrong with the actual ink cartridges or printer. All Epson (and most other makes) ink cartridges use IC chips these days and they're used for one reason...to complicate using non-genuine cartridges, refilling ink cartridges or using a continuous ink system. So what does 'Ink cartridges cannot be recognised' error really mean? It's your printer telling you: 'stop being difficult...get with the system...go and buy some genuine ink cartridges...and I might print again'. Generally yes, unless you have received Epson driver/firmware update. If for example the printer fails to recognise one or more ink cartridges after you enabled an update, there may not be great deal can do about it, other than buy new Epson cartridge(s). Once an update is in your system, there's no getting rid of it. Printer driver update can not be removed by deleting files, programs etc. Even formatting your hard drive and re-installing the original printer driver (from disk) will not achieve anything. Why? Driver update can permanently change the printer firmware (in the printer itself) - and there is no easy fix for this. The only thing you can do at this point is disable future updates and either buy a set of genuine Epson cartridges, wait until updated compatible, refillable or CISS cartridges become available, or throw the printer out and buy another one. This time, take extra care and don't enable driver updates in the process. Find more information on Epson driver updates here. Note: Some printer model drivers may not offer the option to disable driver updates during the set up process. With these printers, you may have to manually de-select the updates after the printer is installed and/or set up your firewall to reject/warn of any system updates trying to upload to your computer. Each printer and operating system deals with driver updates in different way, but the general principle is the same. 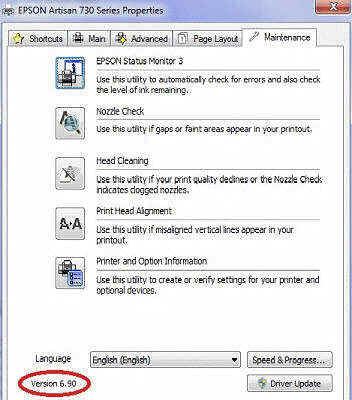 If you suspect your printer problem was caused by a driver update, you can confirm this by checking your Epson printer driver version. You can find it in "Printer properties" on "Maintenance" page (see below). To work with driver version 6.9 for example, you need cartridges/chip version 6.10 or higher (eg 6.12). The version # is printed on some chips, but not all. If your chips are lesser value than the driver version, there is a fair chance that a new driver or update is the cause of the loss of cartridge recognition. Note: Even with higher value chips (than driver version), recognition is not guaranteed...but is more likely. How to fix Epson iInk cartridges cannot be recognised' error? Ink cartridges cannot be recognised errors not related to printer driver update, or an empty cartridge can mean that either a cartridge is not clicked in correctly, the chip is dirty, faulty, or the chip contacts (in printer) are damaged. Try following the steps below to determine which it is. Make sure the printer is powered on - unless advised otherwise. 1) Remove/install the 'not recognised' ink cartridge. 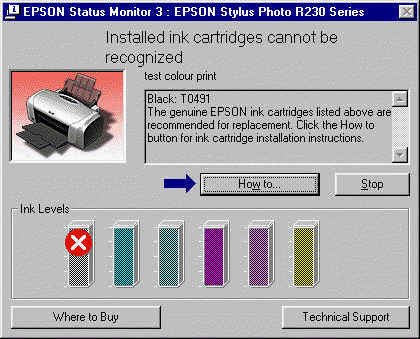 Epson 'ink cartridges cannot be recognised' error can simply mean that the cartridges are not clicked in properly. Non genuine cartridges and particularly CISS cartridges can take a fair amount of force when installing - more than Epson genuine cartridges. Close the printer lid and/or press the 'Ink' button on printer - when finished. If the error disappears and the printer now says 'Charging ink' or returns to the usual 'home' display, the problem is solved. If the 'Ink cartridges cannot be recognised' message returns, try repeating this process once before moving to the next step. 2) Remove all ink cartridges and inspect the cartridge chips. If dirty or inky, wipe all chips with damp tissue then polish with dry. Fit cartridges back in printer. If the cartridges not recognised' message returns, go to next step. 3) Remove all ink cartridges, close the printer lid and turn the printer power off. Power the printer back on and fit only the originally ;not recognised' cartridge. Close the printer lid and/or press the 'Ink' button,, wait while the printer is 'checking ink cartridges' and see if it now recognises the 'faulty' cartridge. If yes, fit all the remaining ink cartridges, then close the lid and/or press the "Ink" button. If the same error returns, try repeating this process once more, before moving on to next step. 4) If you still have the original cartridge set that came bundled with your printer (or any other cartridges) try installing that set. If the error clears, this would indicate your other 'not recognised' cartridges/chips may be faulty. If the same Ink not recognised' message displays with the replacement (for same cartridges), go to next step. 5) Remove all cartridges and inspect the chip contacts (in printer). Epson printers use a series of thin gold plated wire contacts that the cartridge chip slides and presses against - when cartridge is installed. These contacts can corrode, or stick to the chip, particularly if they ever had any ink contamination. The wires can sometimes bend, or even get pulled out - with cartridge, when it is removed. If this is the case, there may not be that much you can do to fix it, other than getting the printer serviced. Note: If you can find the missing wire contact and it's not damaged, sometimes it's possible to push it back in it's slot. It's fiddly and you need good eyes, but it can be done. WARNING: Switch printer off at power point or disconnect the power cable before performing any printer repairs. Also be very careful not to bend or damage some other part in the process. 6) If all the wire contacts appear ok, try cleaning them with damp cotton bud or similar until they're all spotless. It is a good idea to unplug the power cord any time you're working on the chip contacts. When finished, install all cartridges back in printer, plug the power cord back in, turn printer power back on and....see what happens.